SPECTRO is a recognised provider of environmental services with the highest quality. It is a recognised lab and consultancy organisation from ministry of environment and forests and various state pollution control boards. It offers specialized services for all components of environmental concerns. We are involved in providing a wide variety of high quality Environmental Monitoring & Analysis Services to our clients. Our skilled professionals have rich experience in this domain and understand the varied requirements of our prestigious clients that help us to provide the best services. Excel Enviro Tech has installed State-of-the-art Laboratory for Monitoring, Analysis and Testing of Environemntal Parameters including Air, Water, Wastewater (Effleunt), Stack Gas (Flue Gas), Solid waste (Sludge), Noise. Being one of the reputed organizations of the industry, we are offering an exclusive range of Environmental Monitoring Service to our precious clients. These offered services are rendered using high quality components under the supervision of skilled personnel. Further, one can avail these services from us in various types at leading prices. - Ambient Air Quality Monitoring Survey as per NAAQS / EPA / Indian standards. - Source / Stack Emission Monitoring. - Fugitive / Chemical fumes emission monitoring. - Performance study for Pollution Control Systems, such as – Scrubber, BAG Filter, Dust Collector & ESP. - Work zone / Indoor air quality monitoring as per OHSA / NIOSH / Indian Factories Act, 1948. We offer Environmental Monitoring & Analytical Services and also carry out sampling and analysis of stack emission, ambient air, noise, soil, waste water, and hazardous/non hazardous solid waste. We also undertakes annual contract for routine sampling and analysis of various samples as per requirement of consent to operate. Lab Setup Examples. Environmental Monitoring Laboratory. Petrochemical plant test lab. NDT and mechanical test lab. Polymers and rubber testing lab. Potable and Wastewater Testing Lab. Dairy Products Testing Lab. Processed Food Testing Lab. Forensic Testing Lab food. We are Delhi Pollution Control Committee approved i.e. DPCC. We provide envinronmental monitoring services. 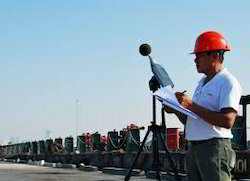 Testing services for noise, water, air, soil. We are amid one of the renowned names involved in presenting to our clients Environment Monitoring Service.